Lately, it seems like it's been raining peppermint cleaner. In my wild enthusiasm to share Agatha's Peppermint Cleaner with the world, there have been a few missteps. The honest to goodness product from a recipe refined in my farmhouse kitchen and finally after years of people begging for bottles (once you smell it and clean with it you'll know why) proudly wearing the Agatha's Apothecary label. It's my favorite cleaner in the whole wide world. I'll try to restrain myself but it's truly totally amazing. Peppermint oil and other completely natural ingredients, mean I'm not afraid to use around two or four-footed little people and nor will you. (Agatha is taking notes for future reference). #1. It is not necessary to buy sample bottles by the case. (Since we now have several gigantic cases of second, third and fourth choice bottle rejects stored (hiding from husband) in the basement. #2. Finding the perfect trigger sprayer was hard but it's not necessary to buy sample sprayers by the case. (See #1). #3. It's a good idea to carefully proofread the labels before ordering in bulk. For example, special attention should be paid to the number of ounces in the bottle. (For those kind souls who received the 18-ounce bottle with the 4-ounce labels, please accept Agatha's sincerest apologies, this will be remedied shortly (or as soon as we use up a whole bunch more labels). #4. When answering a nice customer's request asking for samples to hand out to friends and family, (hugs to Carolyne). Be sure to send huge package full of bottles to the CORRECT customer. (Agatha sends apologetic wags to bewildered Gail C. in Texas who, instead of finding one bottle of cleaner in her shipment, opened her HUGE box to find 2 dozen additional bottles. #5. It might be a good idea to order takeout if we are going to keep meals on the table. Dinnertime may be occasionally (often) delayed as we sort out issues in the bottles, sprayers, labels, shipping & free samples departments. (Agatha says this area in particular needs improvement sooner rather than later). #6. It's probably not really important to obsess over how many bubbles show in the images for the ads on Amazon. OK, so I adore how it bubbles up when given a shake to activate the peppermint oil, but, counting the bubbles and sending the poor graphic artist multiple pictures of said bubbles (so she can see them REALLY CLOSE is way overthinking the process). (Agatha say's it's kinda like watching paint dry). #7. Check shipping rates carefully before fulfilling orders. Spending MORE on "Free Shipping" to send the package than you MAKE on the contents is probably not good for business. Especially as Agatha reminds me, the goal is to actually receive $$$ for all this drama and hard work. "Woof Woof!!! (Please buy more stuff"). All kidding aside, we're just so excited about this newest of Agatha's Apothecary products. It really was created here at the farm with Agatha helpfully napping nearby (while I slaved over the process). Welcome to the blog where Agatha & I share stories and coupon codes and other doggie goodness! Get your very own free sample of Agatha's Amazing Peppermint Cleaner with any order from Amazon or Agatha's! We have the most amazing customers. Really and truly, some of the most wonderful people who not only love their own dogs but who love Agatha & her products. Even some raving fans who actually hand out samples and write me letters like the following from Carolyne who is definitely going above the call of duty giving away her own Elixir for samples lol! 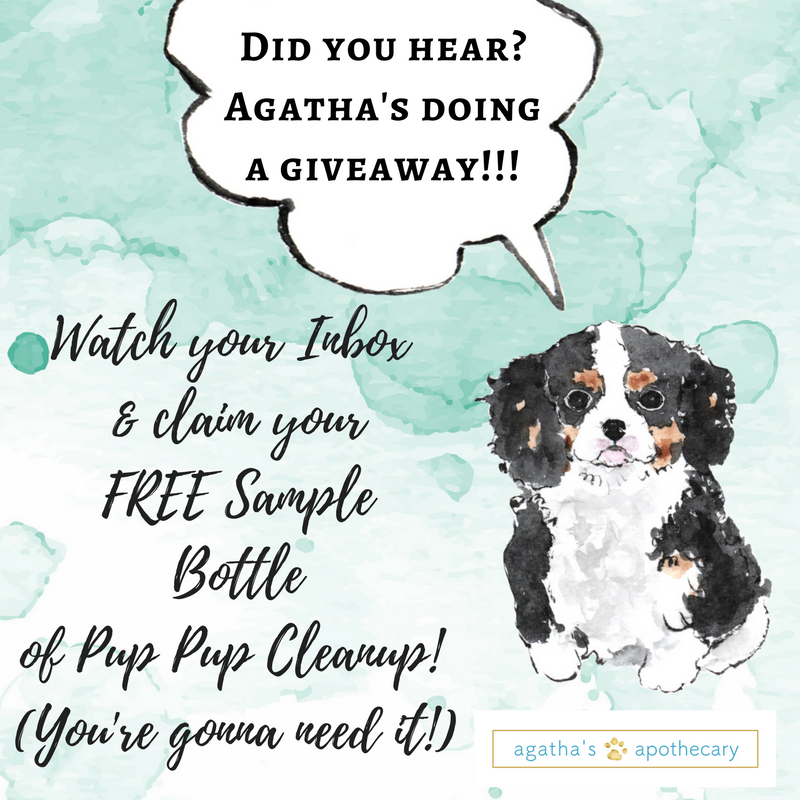 "BTW, I've been handing out samples of Agatha's Elixir to folks out here (New England area) and am getting good feedback - I think the Elixir and the Fur Freshener are my favorite products but I have them all... ; ) I gotta give you props- the new puppy treats you have in your puppy supply list are amazing. I think I have nearly two of everything so I don’t run out, lol. You really do have the best products out there. I save the elixir containers and fill them up to give out to friends that get puppies or talk about dogs with no appetite. Just like with children, sometimes it takes a village with our pups too ; )"
Or What about the incredible lady who left 5 Five Star Reviews today?!? WARMEST & Fondest WAGS! WE WUV YOU!!!!! We've had more than our fair share of snow this winter. Agatha couldn't be happier. My silly little dog loves the fluffy white stuff. I mean she realllly loves it. I'm in the midst of cooking dinner and I see her eyeing the door with a look of happy anticipation. Clearly she's asking to go outdoors. The problem is that she's already been outdoors, a whole bunch of times (about 10 times in the last couple of hours to be honest. It's really hard to resist that face. It's the snow, she thinks it's ice cream. For some reason she's decided that it's the most yummy stuff she's ever tasted and each time she goes outside, she plunges her face deep in the fluffy whiteness and enjoys a few mouthfuls before heading around the yard to see if the squirrels have been at "her" peanut feeder again. The next problem is that those beautiful long ears of hers are quite efficient at gathering a bit of snow of their own and each time she comes back inside I have to scoot her over onto a big rug to drip dry until her next trip out for a little snack. She's so happy about the snow, I can't be upset at her. Just look at her, those eyes, how can I be so hard-hearted she asks? Ever the optimist, she waits. Patiently she watches, staring at me with all of her might, using her secret weapon anytime I glance in her direction. The ultimate trick in her doggie toolkit, BLINK EYE, she carefully blinks one eye to let me know what a gooood dog she is, how deserving of just one more trip outdoors. Big brown eyes plead. I stir the spaghetti sauce with a hard heart and pretend I don't know what she wants. Ten minutes later John wanders in and innocently lets her out again, and sure enough, soon I hear her scratching at the back door this time with about a bushel of snowballs dangling like earrings from her ears. It'd be funny but do you know how long it takes her ears to dry when fully saturated by a bushel of snowballs? Much dripping on floors and mopping will be in my immediate future I promise you. Back inside and in her favorite spot to wait for the next snow opportunity. One nevers knows when the ice cream truck will make it's next delivery!